Big Finish start their second series of full-cast Blake's 7 audio plays with Scimitar, set in the third season of the original BBC television show. Josette Simon, not surprisingly, decided not to take part in this series of full-cast Blake's 7 audio plays, so the Big Finish team decided to make her character Dayna the subject of the show. She's missing and the rest of the crew set out to find her. The crew though now also includes Del Grant among its number. 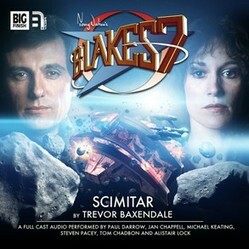 The second series of full-cast Blake’s 7 audio plays from Big Finish starts with 2.1 Scimitar, set in the third season of the original BBC television series. The story sees Paul Darrow return as Kerr Avon, Michael Keating as Vila Restal, Jan Chappell as Cally, Steven Pacey as Tarrant and Tom Chadbon as Del Grant. Alistair Lock plays the computers Zen and Orac. Guest stars are Buffy Davis as Karlov and Daniel Brennan as Drince. Josette Simon, who played Dayna, is the obvious absentee, but given the actress’ well-known disassociation from the show, this is hardly surprising, though I am sure they could have found someone else. When the BBC did its two Blake’s 7 radio plays in 1998 and 1999 they recruited Angela Bruce to play Dayna, so it would not have been a surprising move to have casted an alternative. As it is, they got round this by having a plot that centred on Dayna being missing. Written by Trevor Baxendale, the story is based on the search for Dayna. The crew discover that she has secretly teleported off the Liberator and left Zen with strict instructions not to reveal her reasons or destination. The search takes them to a high-radiation area of space, where a battle in the recent galactic war was fought. Here a mysterious asteroid turns out to be the Scimitar, a Federation cruiser presumed destroyed in the battle. To add to the mix, a Federation salvage ship also seems interested in the Scimitar. Having Del Grant as a regular member of the crew – rather than a minor character as he was in the original BBC show – takes a little getting used to, but I did enjoy his James Bond moment. The communications problems caused by the radiation form a good method of increasing tension as the Scimitar starts to disintegrate and Karlov and Drince on the Federation salvage vessel are entertaining minor characters. The plot itself moves fast and is easier to follow than some audio adventures. All in all, a solid start to the second season. The quarter of an hour of extras start and end with bloopers from the recording. This is followed by interviews with producer Cavan Scott, director Lisa Bowerman and script editor Justin Richards. The new actors also get a look in with Buffy Davis and Daniel Brennan. Bowerman tells us that Scimitar is the set-up episode for the rest of the season with the on-going mission to find Dayna. The addition of Del Grant is covered with a brief chat with Tom Chadbon. Recorded at Audio Sorcery and directed by Lisa Bowerman, the hour-long Scimitar is available from Big Finish both as a single CD and as a download. Its production code is BFPB7FC008 and its ISBN 978-1-78178-404-4. The music was by Jamie Robertson and the sound design by Martin Montague. The cover art is by Grant Kempster. The producer was Cavan Scott, the script editor Justin Richards and the executive producers Jason Haigh-Ellery and Nicholas Briggs. The download also comes with a copy of issue 69 of Vortex magazine, which includes an interview with Cavan Scott about this new series of Blake’s 7 audio adventures. There is also a preview of the new Blake’s 7 novel Criminal Intent – also written by Trevor Baxendale – and a look back at the Blake’s 7 audio adventure Warship. The tenth in the Big Finish series of Blake's Seven audio plays contains three stories featuring Blake, Avon, Vila, Servalan and Travis. The ninth in the Big Finish series of Blake's Seven audio plays contains three stories featuring Avon, Cally, Tarrant, Vila and Del Grant.